Why stay at the Bora Bora Four Seasons Resort? Astonishing views from every aspect of the resort. Carefully planned over water bungalows ensure privacy. Large sunken bathtubs with lagoon views. Carefully curated selection of activities and excursions. The most picturesque and luxurious spa of all the Bora Bora resorts. For years we've heard a whisper that the Bora Bora Four Seasons Resort is one of the best in the world. Which explains why it has some of the highest rates for 'rooms' in Bora Bora. We'd experienced all of the other resorts so on our last trip we were eager to stay at the one our travel agent was raving about. We knew we were in Bora Bora every moment of vacationing at Four Seasons! 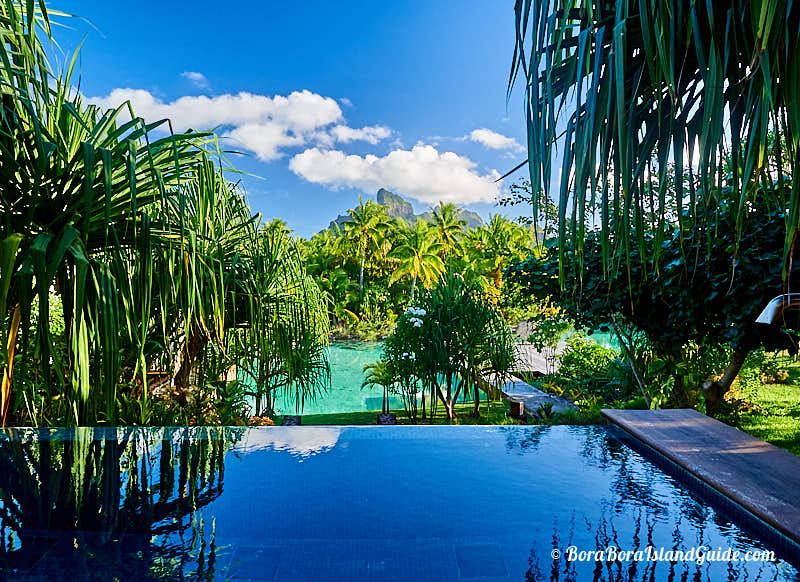 The Bora Bora Four Seasons resort has one of the best positions in Bora Bora to capture views across the turquoise lagoon to majestic Mt Otemanu towering majestically above the lush main island. The brilliant layout of the Four Seasons Bora Bora allows guests to enjoy spectacular mountain and lagoon views from everywhere around the resort. Tranquil inner lagoons weave around beautiful beaches, offering invitations to relax, snorkel, and paddle. Mysterious paths meander through tropical palms, and romantic bridges lead across the water, connecting each area of this extraordinary resort. 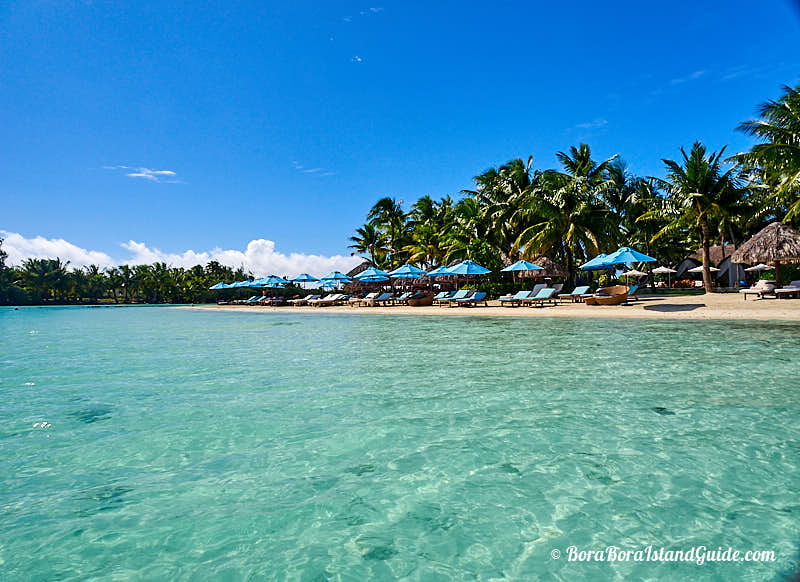 Lazing on the Four Season's beach is time-stopping. 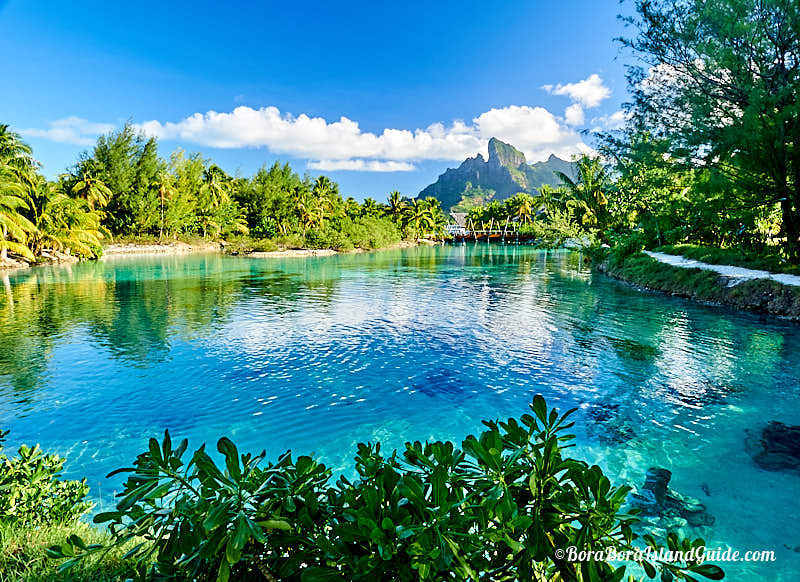 The wide panorama of Bora Bora Island, the water, and a cloud-decorated sky; with tropical palms and the resort's gorgeous main area behind; wrapped me in paradise. The beach drew us from the luxurious comfort of our overwater bungalow, with it's direct access for swimming, and added another dimension to our stay. Lying on a sun-lounge, pampered by exceptional service I felt like I had stepped out of my life into a movie. Most of us are lured to this far-away tropical island by the notion of sleeping in a romantic overwater bungalow above the world's most beautiful lagoon. The Four Seasons overwater bungalows bring the wildest fantasies to reality. Offering both sophisticated elegance and practicality they were also built to maximize every possible view of Bora Bora's signature mountain. Even if you aren't in a category which touts 'mountain view', chances are that you will have a peek from part of your balcony and your private pontoon. You can also savor a sensational panorama while walking out to your over water pad. If you're a 'land lubber' or have extra people in your party, a stay in the very private, super-spacious 2 bedroom beach villas will upgrade your vacation to that of a star. 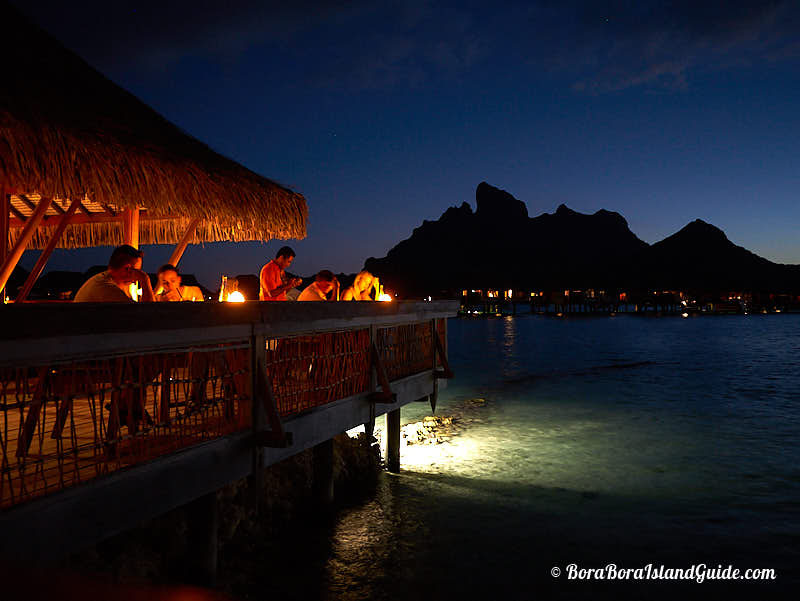 We felt truly 'looked after' at the Bora Bora Four Seasons. All the staff we encountered were helpful and friendly. Many were local islanders who have worked at this resort for years. It seems that company employment policies mean Four Seasons has a network of loyal staff who bring a little extra to their work. So Four Seasons is managing to keep service at a higher level than some other luxury Bora Bora resorts. Although guests are mostly honeymooners and couples celebrating anniversaries, families with children also fit in happily at the Four Seasons. There's a vibrant kids area tucked away, with attendants dedicated to co-ordinating daily activities. This resort includes experiences to engage children and gives every family member a dream vacation. We also chatted with groups of friends who were living out their dream of having an overwater bungalow at the Four Seasons. All the factors that make this the world's most lauded island have been utilized to create a spiritually-uplifting ambiance in this superbly situated spa. You'll pay top dollar for the privilege of a Polynesian pampering in the spa at Bora Bora Four Seasons Resort, but it will be an exceptional experience. Fortunately all adult guests can enjoy a memorable soak in the serene pool-with-a-view. 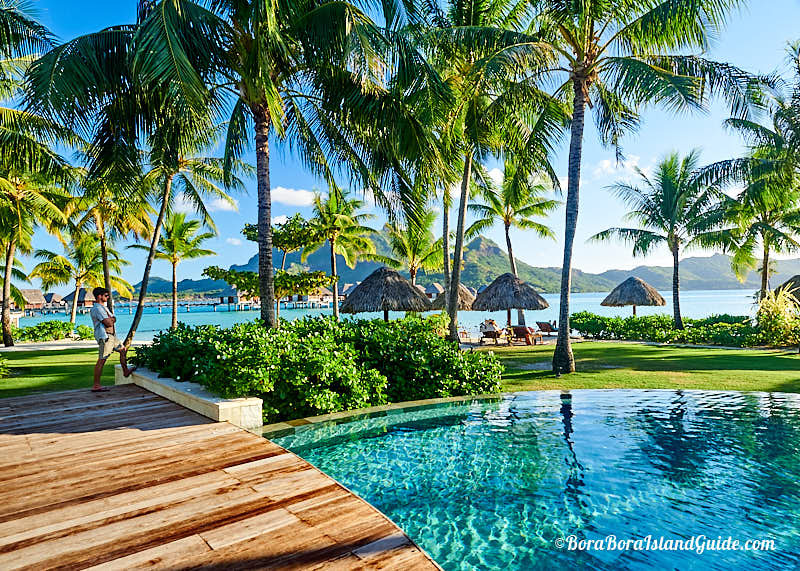 You don't have to leave the Four Seasons Bora Bora resort to have a great time. There's a wide variety of interesting activities, tours, classes, and private coaching sessions, some of which are complimentary; adding to the laid-back, I'm on vacation, spirit. When you see the Four Seasons pool you'll find it hard to leave! Those wanting to experience more of the island's novel things to do can ask the Concierge to arrange one-of-a-kind outside activities in Bora Bora. The Four Seasons offers a selection of experiences that are tailored towards a private excursion experience, but they also have group tour options from reputable Bora Bora activity providers. You'll pay a little more for these activities than if you plan and book “must do” excursions yourself, before going. 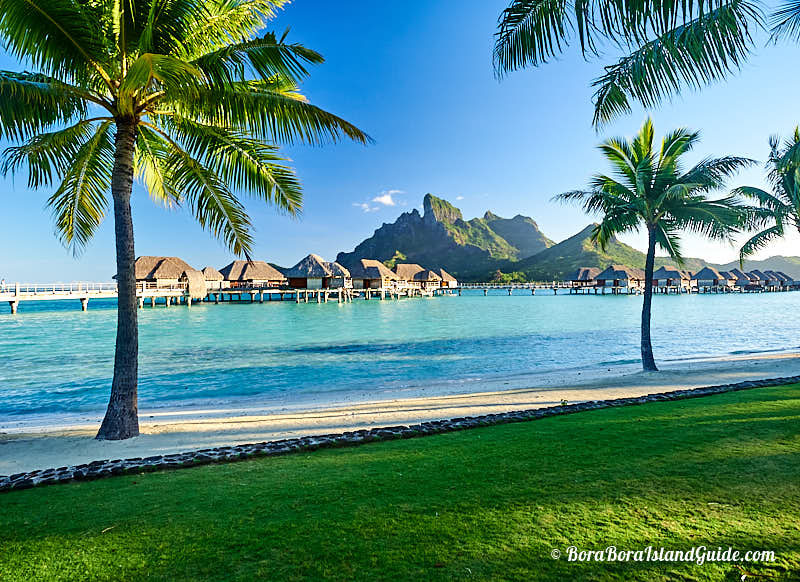 We're have compiled a 'Best of Bora Bora' overview and comparison. This has detailed information to help you have the best experience while staying at the Four Seasons. Read our review of a Bora Bora Four Season stay. 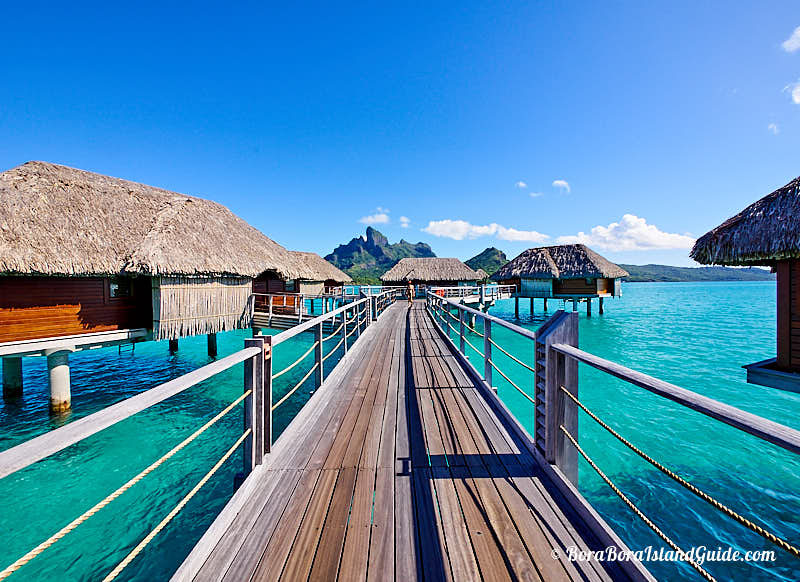 Want the best value Bora Bora Four Seasons vacation? When you know the resort you want for your Bora Bora vacation we highly recommend contacting this dedicated Tahiti travel agent who can organize a package with extras, for near wholesale rates, while still delivering a concierge-like service.